In my high-school AP English class, we were asked to judge the relative poetic merit of four or five quotations, with the choices being something like — a Hallmark card, something by Frost, directions from a recipe, something by Hemingway and “a²+b²=c²” Several years after graduation, my teacher told me that I seriously argued for the Pythagorean Theorem on the basis that it was the only one that offered certain knowledge in succinct and certain language. And that she told several subsequent classes after I had taken it that I was the only person in her 20 years of teaching to argue for the poetic merit of a mathematical proof (she said she stopped naming me when the students were no longer close enough to my age to know who I was; otherwise, it wasn’t funny). I repent. 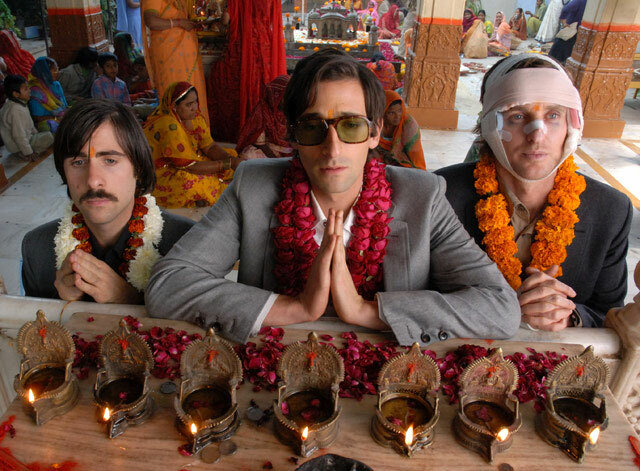 And THE DARJEELING LIMITED did it. I cannot say I have ever really been a fan of Wes Anderson. In fact I joked that when I saw THE ROYAL TENENBAUMS, that I was as stone-faced as Gwyneth Paltrow was during the film and that I took it as training for a future job as a Buckingham Palace guard. 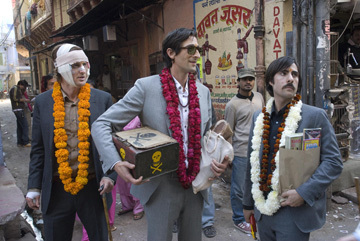 But DARJEELING LIMITED is the first one I’ve actually *hated. * The previous ones (I’ve seen all but BOTTLE ROCKET) were aggravating, over-rated, smug, self-satisfied, but intermittently funny and so obviously the work of a talented and original mind, that the obligatory hope pushed my dominant reaction toward disappointment. No more. I officially give up on Wes! unless the buzz for some future movie is that it’s nothing like his previous ones. It’s not that anything in DARJEELING is so markedly different than before or transcendently unacceptable. It’s more that this was the first time that all I got from the movie was Anderson’s annoying stylistic little quirks, to the point that the entirety of my viewing notes consist of reasons the film was aggravating me. Or maybe it finally became undeniable to me that Anderson will never overcome his flaws as I see them because he is too invested in them as his virtues. Anderson’s framing has always been tight and flat, squishing the visual space to the point that his personages are pinned and propped onto these depthless compositions like moose trophies from the taxidermist. But never with any regard for anything plausible. 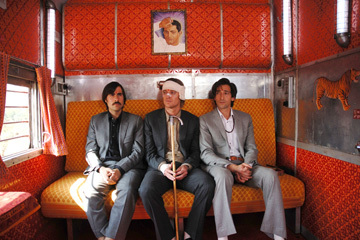 In one shot from DARJEELING, for example, the three brothers (filled in screen space by Jason Schwartzman, Adrien Brody and Owen Wilson) on a spiritual journey to India are sitting side-by-side on the same bus seat, despite the fact that when you look around, everyone else aboard is sitting one or two to a seat. In the still attached to this paragraph, because the brothers are near the bottom of the frame, there has to be a compositional weight above them, and it has to be perfectly centered to follow The Rules of Composition. It’s the directorial equivalent of an actor smiling at the audience to rfemind it that he has remembered his lines. Everything in the movie is in threes, as if this was Schoolhouse Rock’s magic number. Each of the three brothers has a type of medicine; each has a secret that he tells one brother on condition that it’s their secret against the other (all get betrayed in turn); each even “gets” an Indian boy to save from drowning — “I can’t save mine,” Brody pleads (what … you say there are families with 4 brothers or 2 sisters or a mix of boys and girls, and they don’t all get threatened with drowning simultaneously? Not in this movie there ain’t); each leaves the other two at the final train station to make a phone call; each is fixated in some positive or negative way on a particular woman (wife, girlfriend(s), mother). I was waiting only for them to start building houses of straw, sticks and bricks. In DARJEELING, Anderson amps up his symmetrical compositions by having the camera move in exactly the same way. Always along a straight line. Always during a strictly defined period, and to a complete stop. Never with any regard for character movement, or anything other than the design. One shot, while waiting for a bus at an Indian village, the camera takes a 360-degree pan, but stopping with clusters of characters at 90 degrees, 180 degrees and 270 degrees. And always to a perfectly balanced shot centered on 90, 180 and 270. It’s the director jumping out from behind the camera and yelling “look how clever I am, framing and planning everything down to the millimeter.” In another scene, the three brothers and the Indian girlfriend have a conversation spanning two railroad compartments, during which the camera, viewing the conversation from the outside passageway, completes four perfectly-straight line moves, each at a 90-degree angle from the last one (left and right, up and down), so as to track in the shape of a rectangle. And the fact that I remember the path of the camera movement and not what was happening should tell you everything you need to know about how obtrusive and self-regarding it is. The effect of all this precision and symmetry is that Anderson has filmed not a drama but a mathematical equation. The Pythagorean Theorem really isn’t very artistic, Victor. Nor is the content any less contrived, abstract and airless. This is supposed to be a spiritual journey to India, to find their mother and get over her missing their father’s funeral. I would say the metaphors rush in, but they more like “clang” in. DARJEELING starts with Bill Murray, the father figure in two of Anderson’s last three movies, being left behind by the train. Get it — the father’s dead; this is a journey to leave him behind. Like the train did. DARJEELING ends with the three brothers chasing after a train and yelling “the baggage isn’t gonna make it,” and so they can only catch the train by ditching the baggage. The father’s personalized baggage. A matching set. With monograms. In Wes! font. It all must be left behind. Am I spelling it all out clearly enough for you? In case I’m not, Anderson films the scene in slo-motion to some pop song. DARJEELING has another funeral in the middle of the movie, which I think is supposed to represent the brothers being hit in the face with the reality of the suffering of others far greater than their petty concerns. Kinda like leaving behind the father’s matching monogrammed baggage, but I could be wrong about that. DARJEELING has a character who spends most of the movie with his face bandaged and busted-up. Late in the movie, he takes off his bandages, assessses his face and said “I guess I still have some more healing to do.” Get it? It’s a spiritual journey, but he still needs healing. DARJEELING characters repeat lines like “the characters are all fictional” and “let’s make an agreement” like talismans, until it comes time for resolution, and then the line is at the exactly perfect moment, somehow broken or restated. There’s a German mechanic shop named “Luftwaffe Automotive” (what … had someone already taken the more-logical “Wehrmacht Automotive”?) Everything in this carnival of contrivance is too drunk on its own supposed cleverness to connect with anything other than the sensibility of the “in”-crowd. I understand this movie isn’t trying to be naturalistic. My complaint isn’t that the style is stylized, simpliciter (how could it be, given some of the movies I most love). Rather, the stylistic quirks, the little curlicues of Wesness are the sole and only point. Wesness isn’t a style concerned with subject matter or even with style for style’s sake, like a Felliniesque virtuoso. It’s self-referential commercial, concerned with BEING a style to the point that the film exists only as self-promotion. And Anderson’s characteristic deadpan would-be-comic tone maps onto the film’s being too cool to recognize its own ticks. Self-referentiality all the way down becomes obnoxious self-absorption. In love with its own pat cuteness. I’ve officially had it with Wes! I dunno, man, you make it sound pretty good. I’ll find out soon enough. But THE LIFE AQUATIC WITH STEVE ZISSOU is one of my favorite movies. Well, I saw it, and it wasn’t very good. But not because the stylistic quirks were bad. I loved those. The movie was bad because it was about characters I didn’t care about, and they didn’t do anything interesting, and it all seemed like a weak retread of a movie Anderson had only done a few years before, except on a train and in India instead of in New York. It’s his best movie, one of my favorites. I’d love to see your comments on it. He’s 2 for 5. If this was baseball he’d be batting .400! I’d like to offer a point by point review of your review, but I’m not going to. Suffice to say, I think you just didn’t get it. Why is strong metaphor or uniquely linear style elements so offensive to you? Would heavily blanketed unrealistic metaphor be more preferable, like nouvelle vague? Would unpredictable style shifts be better? Bird’s eye shots to handicam running scenes? Well, agree to disagree. I thought this was one of his best.